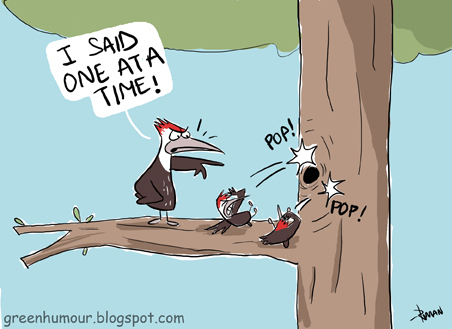 Green Humour: What flew into the Woodpecker's nest? What flew into the Woodpecker's nest? I often wonder what it would be like if all the members of a Woodpecker's family wanted to enter or leave the house at the same time! Most woodpecker species nest in cavities in tree trunks, that they carve out using their strong, chisel-tipped bills, although some desert species are known to nest in holes carved in cactuses or dug on the ground. The woodpecker excavates one hole every breeding season, usually after multiple attempts. Last year I had the pleasure of observing a pair of Lesser Flamebacks at a nest, raising the chicks; alongwith my brother at Seminary Hills in our hometown, Nagpur. This species like several other woodpeckers, is monogamous, with both parents participating in nest-building and caring for the young. We observed the parents taking turns to feed the chicks, chasing potential predators and nest raiders like the mynas, and even teaching the young to fly. Abandoned cavities created by woodpeckers are used by several otgher species to breed, such as parakeets, owlets, starlings and mynas. In Central India, the Common Myna is a blatant nest-bully, that makes continual attempts harrass woodpeckers out of their nests and occupy the cavity.